Available in the Ubuntu Software Center. You can also donate a small amount to support development of DayFolder. 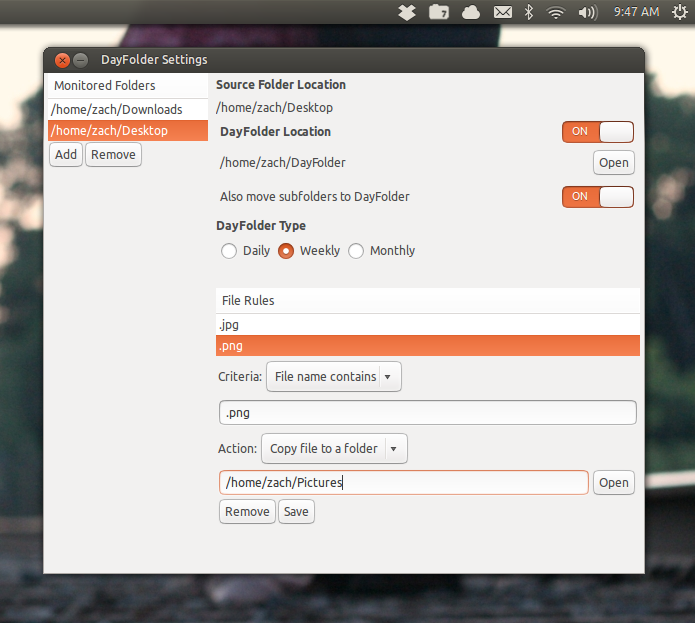 Use DayFolder to intelligently organize your Downloads, your cluttered Desktop, Pictures, or any other folders you have. For each folder, you can choose to have all files sorted or to have DayFolder move, copy, or delete certain files based on rules you create. Files are sorted by moving them all into a folder with today’s date, and you can organize these folders by day, week, or month. Rules help you organize pictures, documents, ebooks, and more just the way you like by taking special action on those files. Check out the screenshots below for examples on how to set up DayFolder to help you. 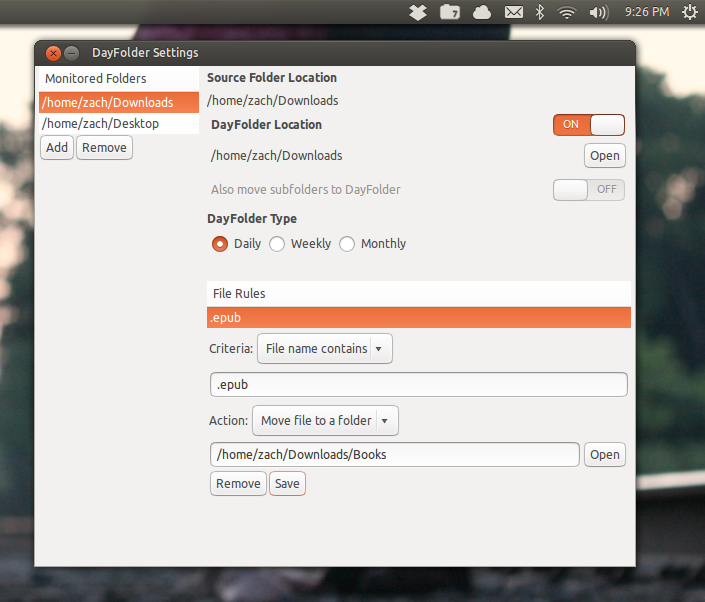 Click the images to view the full DayFolder settings window shown. Try this configuration to have DayFolder organize all of your Downloads right inside your Downloads folder. Set up rules to send different kinds of files to the places you used to send them manually. A special folder for downloaded ebooks, videos, torrent files, and more. DayFolder will keep your desktop clean, and makes the Desktop a great place to store temporary work and can organize it wherever you like for future reference. Organize everything by day, week, or month, whichever makes it easiest for you to go back to later. DayFolder is always handy and ready when you are. Tell it to clean up your folders quickly from the panel. Check it out in the Ubuntu Software Center! Feel free to ask questions or give feedback by contacting me by email at zach [at] stew [dot] dk. The file rules only work on the monitored folders. If does not search into subfolders. Is there a why to do that? Hm, no, unfortunately it doesn’t process rules in sub folders. Click the Add button on the left side of the window. It sounds like you have no Monitored Folders. How frequently does Dayfolder auto-sort the files? I waited over a day but nothing happened until I clicked on the Clean Up option in the indicator. Right. It does not automatically run without being told. For what I’ve used it for, I wasn’t sure how to best have it work automatically. So, it only runs when told. Maybe it could auto-sort at start-up / boot. Is it using inotify to watch the folders? It doesn’t watch folders for changes. Cleanup is triggered manually. It doesn’t look at mime types.. But it can take action on files with a certain file extension if you set it up. If you’re interested in trying it, let me know and I can get the latest version in the PPA so you can try it out.